Propagating through the ocean, light interact with water and its constituents, causing physical (heating), chemical (photochemical reaction) and biological (photosynthesis) changes. The ocean contains a diverse mixture of dissolved and particulate matter that constantly change in time and space. Each of these constituents exerts an influence on the spectral absorption, angular scattering, and polarization state of light. Therefore, the optical measurements implicitly contain embedded information regarding the concentration, sizes, composition, shape and structure of these materials and their dynamics. A major focus of my research is to decipher these linkages to retrieve useful information about various water constituents from optical measurements. When extended to optical data obtained remotely from in situ or air- and space-borne platforms, such measurements offer observational capabilities over a much broader range of temporal and spatial scales over which regional and global investigation of the ocean can be conducted.While always passionate about studying ocean, I have also applied my knowledge in optics to water bodies that are much smaller than the oceans but are more regionally relevant. I'm interested in detecting, monitoring and/or mitigating changes of water quality in lakes, rivers and wetlands as a result of changes in regional climate and land use.With a B.S. degree in computer science, I have always enjoyed programming. I have developed a couple of web-based decision support systems utlizing remote sensing data for precision agriculture. When it comes to mass/carbon fluxes out of the surface layer, all particles are not created equal. Their composition and size distribution play critical roles. In essence, this project will use recent optical technological and theoretical advances to describe the key aspects of particles that control their fluxes from the ocean surface, contrast the export fluxes from different particle types, and relate those to broad classes of phytoplankton communities present in the surface layers for which satellite remote sensing algorithms exist. Objective (i): Measure the vertical distribution of the spectral absorption coefficient (a) and volume scattering function (VSF, β), which will be augmented by additional optical observation of an imaging flow cytometer and an underwater vision profiler (UVP). Objective ii: Estimate the size and density distributions of particles of sizes from 20 nm – 200 μm from the VSF data, the particles size distribution from 5 - 100 μm from the flow cytometer data, the particle size distribution from 100 μm to 20 mm from the UVP data, and phytoplankton size fractions from the absorption data. Objective iii: Estimate the total and size-fractioned mass flux using the optically derived results of particle size and density distributions from Objective (ii). The size-fractioned flux will be contrasted between (1) dissolved vs. particulate; (2) small (< 100 μm) vs. large (> 100 μm) particles; and (3) communities dominated by different classes of phytoplankton. Objective iv: Apply statistical analysis to investigate (1) how the mass flux estimated based on VSF-inversion results (i.e., size and density distribution from 0.02 – 200 μm) relates to the total flux and (2) how the phytoplankton community (macro-, nano-, and pico-) that can be retrieved from the absorption measurements relates to the total flux. Our ultimate goal is to test if the total mass/carbon flux can be adequately estimated using the biogeochemical variables that can be retrieved from the measurements of inherent optical properties of absorption and volume scattering function in the surface water. This is directly related the EXPORTS’s overarching hypothesis - carbon export from the eutrophic zone and its fate within twilight zone can be predicted knowing characteristics of the surface ocean ecosystem. Objective 1: Develop a satellite-based algorithm to estimate micro-, nano-, and pico-phytoplankton concentrations as well as colored detrital matter (CDM) absorption from the spectral absorption coefficient. Objective 2: Develop a satellite-based algorithm to estimate the mass concentrations of particulate organic matter (POM) and particulate inorganic matter (PIM) as well as the fractional backscattering by very small particles (VSP) from the spectral backscattering coefficient. Here particulates are operationally defined as those retained by filtration (e.g., pore size = 0.2 μm) and VSPs as filtrate. Objective 3: Conduct additional field experiments and use available NASA’s satellite products to validate and quantify the uncertainties of the proposed algorithms and estimated products. Our overarching goal is to apply physical process based understanding to develop new retrieval algorithms for a better prediction of biogeochemical stocks from remotely sensed spectral absorption and backscattering coefficients. The mechanistic nature of the algorithms allow them to be easily adapted for the future ocean color missions, such as the Plankton, Aerosol, Clouds and ocean Ecosystem (PACE) mission. variability in the volume scattering function, and particularly the backscattering that are directly relevant to ocean color observation. This has hindered our ability to derive IOPs accurately and to interpret their variability biogeochemically. in understanding the roles played by particles of different type in generating remote sensing reflectance and the color of the ocean. affecting both the current and future PACE ocean color missions: bidirectional effect and sources of backscattering. refining, the overall modeling approach. scattering as well as to guide the development of new approaches for ocean color algorithms. Particles in the ocean alter the propagation of light, influencing its color, polarization states and spatial distribution through absorption and scattering. Moreover, the size and compositional distribution of particles in the ocean are fundamental properties of marine systems, affecting ecological trophic interactions, transports of organic matter and elements. Particle characteristics not only affect but reflect changes in many biogeochemical processes in the ocean. It has been challenging to characterize marine particles directly in the field, but recent development in using angular scattering pattern by particles offers great potential. This is a proposal to (1) develop an inversion method to infer particle properties from polarized measurements of the volume scattering functions; and (2) evaluate its accuracy at quantifying the size distributions and composition of particulate subfractions. Intellectual Merit: The angular patterns of the scattered intensity and polarization state of the scattered light by particles can be described in terms of a 4×4 Mueller matrix (S) that is fundamentally determined by the sizes, shapes, composition, and structures of the particles. Therefore, the properties of the particles can be potentially inferred from measurements of S. Unfortunately, the complete Mueller matrix of oceanic waters has been seldom measured. Even the most commonly measured component, the volume scattering function (element S11) representing the angular distribution of unpolarized light, was scarcely measured until recently (Zhang et al. 2011 & 2012). Zhang et al. (2011) developed an inversion technique to derive size distributions (0.02–200 μm) and composition information of particles from the VSF. Tested in the coastal waters of the US, the inversion results are consistent with the independent measurements of total particle size distribution and chlorophyll concentration (Zhang et al. 2012 & 2013). The recent advent of the LISST-VSF (Sequoia Scientific, Inc.), a commercial field instrument, presents a great opportunity for us to push the development of the inversion technique forward. The LISST-VSF measures three components, S11, S12 and S22 of the Muller matrix , with S12 describing how particles affect the angular scattering of linearly polarized light and S22 delineating cross-polarization between parallel and vertical polarized light. We propose to incorporate the additional information provided by S12 and S22 using state-of-the-art light scattering modeling capabilities (Yang et al. 2013, Bi et al. 2013) to further constrain the inversion with the following: (i) better knowledge in particle shapes (spherical vs. non-spherical); (ii) reduced uncertainty in non-unique solutions because different particle populations could produce similar S11; and (iii) further improved capability to characterize particles in the size range of 0.02–200 μm. The proposed study will greatly enhance our ability to quantify size distributions and refractive indices (closely linked to particle densities) for particle groups such as phytoplankton cells, detrital particles, mineral particles, bubbles, and emulsified oil (if present). Obtaining information about the unperturbed size distributions, concentration, and densities of multiple individual subpopulations in situ will have a broad impact in the ocean science community. Center for Regional Climate Studies (CRCS) is one of the two core research themes under the NSF EPSCoR RII grant. Exploration of feedback mechanisms between environment and land use changes. My study is focused on the area 3, investigating changes in climate and land use on water quantity and quality in our region. A key challenge in applying ocean color remote sensing for monitoring and assessing water quality is to link the signal “seen” by satellite or airborne sensors with the optically active water constituents and their biogeochemical origin. While our ability to understand and separate the various components of absorption has improved over the last decades, the major challenge remains in the understanding of the sources of variability in the backscattering coefficient. This has hindered our ability to understand and interpret the variability in backscattering and remote-sensing reflectance, including the fields of particulate backscattering coefficient, which play a large role in determining both the magnitude and spectral shape of remote-sensing reflectance in coastal marine environments and inland water bodies. This proposal aims specifically at understanding the biogeochemical sources of variability in the backscattering coefficient, a key indicator of water quality, across a range of water types. From first principles, particle size is a major determinant of scattering because the size of optically significant aquatic particles can vary over at least 4 orders of magnitude, while the real part of refractive index relative to water vary within a relatively narrow range from about 1.02 to 1.20. While early theoretical predictions suggest that submicron particles account for the majority of the particulate backscattering in open ocean, some recent studies indicate that large particles, including phytoplankton, can be a significant contributor. The difficulties in addressing the roles of different types of particles and differently-sized particles in backscattering result from both the experimental challenges to measure separate contributions of various particle types and theoretical challenges to model scattering by arbitrarily shaped heterogeneous particles. The specific objective of this study is to quantify the role played by relatively large particles (> 2-5 micron) in regulating the magnitude and spectral behavior of backscattering coefficient with special emphasis on coastal marine environments and inland water bodies. Our approach is centered on comprehensive measurements and characterization of natural samples of particulate assemblages in terms of (i) particle size distribution, (ii) particle composition, and (iii) full volume scattering function. The measurements involving size fractionation will allow us to verify experimentally the contribution of large particles. The measurements will be complemented by modeling effort to compute the VSF from the measured particle size distribution and composition and to invert the PSDs from the measured VSFs. Comparisons of the modeled results and measurements will aid in the interpretation of measurements and will also provide a basis for validating, and possibly refining, the overall modeling approach. Two types of laboratory-based experiments will be conducted. The first will be to examine optically diverse natural water samples collected in oceanic (California coastal waters) and inland aquatic (Great Lakes) environments. The second will be conducted to examine backscattering properties of several phytoplankton species, characterized by different cell size and morphology. The two types of experiments complement each other, with the former focusing on sizes and composition of particles through a series of size fractionation of natural samples and the latter on phytoplankton species, the major aquatic constituents that are optically active. The proposed study addresses a fundamental, yet poorly known, linkage between the optical backscattering and biogeochemical properties of natural waters. The potential outcome of the study can greatly improve our understanding of the backscattering process in coastal and oceanic environments and thus provide guidance on what and how the biogeochemical state of water can be inferred from the remotely-sensed backscattering coefficient. The crucial issue of growing biofuel feedstock on agricultural land is the possibility of creating competitions for land and water with current existing crop production. The urgent need of producing new-generation energy crops is likely to be met with expansion of agriculture into previously unsuitable and less fertile lands such as uncultivated cropland, marginal land, idle land, and Conservation Reserve Program (CRP) land. However, how this potential alteration of land use and management affect water sustainability, particularly under the looming specter of climate change, remains unknown. The overall goal of this proposed project is to assess the impact of cultivating cellulosic bioenergy crops driven by the crop market/bioenergy policy on water sustainability. The potential impact will be analyzed and contrasted in two river basins in the Upper Midwest – the Red River of the North basin (bordering MN, ND, and SD) and the Republican River basin (bordering KS, NE and CO), each with distinctive hydrological characteristics and irrigation scheme–to understand the water implications (both positive and negative) and identify the most sustainable biomass feedstock for the region’s water resource. The project will focus on growing switchgrass and collecting crop residuals from wheat and sorghum under various management practices (crop rotation, fertilization inputs, tillage, residual collection, and irrigation) on marginal land. To accomplish the goal, we will develop a coupled economics-hydrology model with inputs derived from both satellite and field observations to: 1) estimate how the land use on marginal land would change in response to the market and policy regarding the production of advanced biofuel; 2) assess how such land use change would affect water quality and quantity in the watersheds. This novel analytical framework will provide decision support for evaluating hydrologic consequences of biofuel feedstock production under various policy and climate scenarios. The outcome from this project will help policymakers, farmers, and the society better understand the environmental benefit/consequences in meeting the EISA of 2007’s goal of advanced biofuel. 51. Burke, M., M. Shahabi, Y. Xu, H. Zheng, X. Zhang, and J. VanLooy, Identifying the Driving Factors of Water Quality in a Sub-Watershed of the Republican River Basin, Kansas USA. International Journal of Environmental Research and Public Health, 2018. 15(5): 1041 doi:10.3390/ijerph15051041. 50. Muller-Karger, F.E., E. Hestir, C. Ade, K. Turpie, D.A. Roberts, D. Siegel, R.J. Miller, D. Humm, N. Izenberg, M. Keller, F. Morgan, R. Frouin, A.G. Dekker, R. Gardner, J. Goodman, B. Schaeffer, B.A. Franz, N. Pahlevan, A.G. Mannino, J.A. Concha, S.G. Ackleson, K.C. Cavanaugh, A. Romanou, M. Tzortziou, E.S. Boss, R. Pavlick, A. Freeman, C.S. Rousseaux, J. Dunne, M.C. Long, E. Klein, G.A. McKinley, J. Goes, R. Letelier, M. Kavanaugh, M. Roffer, A. Bracher, K.R. Arrigo, H. Dierssen, X. Zhang, F.W. Davis, B. Best, R. Guralnick, J. Moisan, H.M. Sosik, R. Kudela, C.B. Mouw, A.H. Barnard, S. Palacios, C. Roesler, E.G. Drakou, W. Appeltans, and W. Jetz, Satellite sensor requirements for monitoring essential biodiversity variables of coastal ecosystems. Ecological Applications, 2018. 28(3): 749-760 doi: 10.1002/eap.1682. 46. Xiong, Y., X. Zhang, S. He, and D.J. Gray, Re-examining the effect of particle phase functions on the remote-sensing reflectance. Applied Optics, 2017. 56(24): 6881-6888 doi: 10.1364/AO.56.006881. 45. Shabani, A., X. Zhang, and M. Ell, Modeling Water Quantity and Sulfate Concentrations in the Devils Lake Watershed Using Coupled SWAT and CE-QUAL-W2. Journal of the American Water Resources Association, 2017. 53(4): 748-760 doi: 10.1111/1752-1688.12535. 39. Guo, H., C. Dou, X. Zhang, C. Han, and X. Yue, Earth observation from the manned low Earth orbit platforms. ISPRS Journal of Photogrammetry and Remote Sensing, 2016. 115: 103-118 doi: 10.1016/j.isprsjprs.2015.11.004. 38. Zhang, X. and D.J. Gray, Backscattering by very small particles in coastal waters. Journal of Geophysical Research: Oceans, 2015. 120(10): 6914-6926 doi: 10.1002/2015JC010936. 36. Zhang, X., Y. Huot, A. Bricaud, and H.M. Sosik, Inversion of spectral absorption coefficients to infer phytoplankton size classes, chlorophyll concentration, and detrital matter. Applied Optics, 2015. 54(18): 5805-5816. 30. Zheng, H., D. Barta, and X. Zhang, Lesson learned from adaptation response to Devils Lake flooding in North Dakota, USA. Regional Environmental Change, 2014. 14(1): 185-194 doi: 10.1007/s10113-013-0474-y. 25. Jia, X., T. Scherer, D. Lin, X. Zhang, and I. Rijal, Comparison of Reference Evapotranspiration Calculations for Southeastern North Dakota. Irrigation & Drainage System Engineering, 2013. 2(3): 112 doi: 10.4172/2168-9768.1000112. 24. Rijal, I., X. Jia, X. Zhang, D. Steele, T. Scherer, and A. Akyuz, Effects of Subsurface Drainage on Evapotranspiration for Corn and Soybean Crops in Southeastern North Dakota. Journal of Irrigation and Drainage Engineering, 2012. 138(12): 1060-1067 doi: 10.1061/(ASCE)IR.1943-4774.0000508. 22. Zhang, X., Molecular Light Scattering by Pure Sea Water, in Light Scattering Reviews 7, A. Kokhanovsky, Editor. 2013, Springer: Heidelberg. p. 225-243. 16. Xiaodong Zhang, Digital Northern Great Plains and Zone Mapping Application for Precision Agriculture, in GIS Applications in Agriculture - Nutrient Management for Energy Efficiency, David Clay & John Shanahan (eds. ), CRC Press, 123-133, 2011. 10. Doug Olsen, Changyong Dou, Xiaodong Zhang, Lianbo Hu, Hojin Kim, and Edward Hildum, Radiometric calibration for AgCam, Remote Sensing, 2010, 2(2), 464-477. Access. 9. Xiaodong Zhang, Lianbo Hu, Michael S. Twardowski, and James M. Sullivan, Scattering by solutions of major sea salts, Optics Express, 2009, 17(22), 19580-19585. PDF and Matlab code. 8. Xiaodong Zhang, and Lianbo Hu, Scattering by pure seawater at high salinity, Optics Express, 2009, 17(15), 12685-12691. PDF and Matlab code. 7. Xiaodong Zhang, Lianbo Hu, and Ming-Xia He, Scattering by pure seawater: Effect of salinity, Optics Express, 2009, 17(7), 5698-5710. PDF and Matlab code. 6. Xiaodong Zhang, and Lianbo Hu, Estimating scattering of pure water from density fluctuation of the refractive index, Optics Express, 2009, 17(3), 1671-1678. PDF and Matlab code. These programs were developed during the course of my research and I believe they will be useful for a wider community. They are free to use, but I'd appreciate if you can acknowledge the source. Parameterized Zaneveld rrs model: The BRDF of rrs is fundamentally dependent on the shape of VSFs. The Zaneveld's theoretical rrs model explicitly accounts for the shape of VSFs. We parameterized the Zaneveld's rrs model based on Hydrolight simulations using 114 VSFs measured in three coastal waters around the US and in oceanic waters of North Atlantic Ocean. Scattering of pure water: Instead of using partial derivative of the refractive index with respect to the pressure which can be measured relatively easier, we used partial derivative of index with respect to the density to model the thermal fluctuation of the refractive index. The later can be derived theoretically and the results agreed with Morel's measurements within 2% for a range of values of depolarization coefficient from 0.039 to 0.051. Scattering of pure seawater: This is a theoretical analysis of effect of salinity on light scattering by pure seawater. The variation is due to decreasing contribution from density fluctuation and increasing contribution from concentration fluctuation, with the latter effect dominant. The net effect is non-linear, though not significant. The results agree with Morel's measurement within 1%. Scattering of pure seawater at high salinity: Again this is a theoretical analysis of effect of salinity on light scattering by pure seawater. It differs from the previous study in two aspects. Gibbs energy function is used to derived all the thermodynamic parameters that are associated with density fluctuation. This will ensure all the inter-relationships amongh different thermodynamic parameters are satisfied. Also the model applies to waters with salinity as high as 120 g/kg. The scattering increases with salinity in a non-linear fashion (bending down at high salinity) and linear extrapolation will overestimate by 30% when salinity is 120 g/kg. Scattering by solutions of major sea salts. The salts include: NaCl, MgCl2, MgSO4, Na2SO4, K2SO4, CaCl2 and KCl. Because of ionic interactions among different salts, the molecular scattering does not follow the simple addition rule that applies to bulk inherent optical properties, with the total less than the summation of the parts. Scattering by solutions of NaCl, the major sea salt, is about 6.7% and 4% lower than seawater of the same mass concentration and of the same refractive index, respectively. The model applies to salt solutions with concentration as high as 120 g/kg. Mie scattering codes in Matlab for both spherical and coated spherical particles. The code is numerically stable even for large size parameters and uses an analytical formual to calculate the backscattering efficiency. In addition to the rising water level, water quality is another issue that has to be considered in mitigating the Devils Lake flood impact. The overall salinity level, particularly that of sulfate, are significantly higher than those of the surrounding water bodies of Sheyenne River and Red River, limiting the amount of water from Devils Lake that can be released into the Sheyenne River. 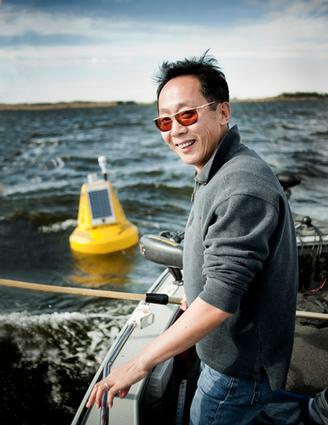 Funded by a NASA project studying water quality in the Devils Lake, a buoy is deployed in the Stump Lake to monitor the change of water quality including temperature, salinity, turbidity, dissolved oxygen level, and chlorophyll concentration. The weather parameters of wind speeds and direction and air temperature are also monitored. The results, together with other observation of regional weather and land change, will help us to better understand how the quality of water changes in response to the weather and long term climate changes. A series of Landsat images. David Barta, our graduate student at ESSP, analyzed the Landsat images to delineate the boundary of the rising lake. Craig Helgason and Jane Peterson helped to create the animation. Precipitation from NASA TMPA (TRMM Multi-sensor Precipitation Analysis) data. Cumulative daily precipitation for the last decade shows that there are interannual variability with total yearly precipitation varying between 350 mm (14 inch) and 550 mm (22 inch). The precipitation for the year 2010 is very similar to the mean precipitation for the last decade. Devils Lake has been rising steadily since 1993, and the satellite data shows that the pattern and the amount of precipitation remain relatively steady, or in other words, the wet cycle which has been going for the past 17 years shows no sign of change. So far, the precipitation for the year 2011 (up to 06/30) is slightly lower than the average of past 10 years. However, the snow fall in January was higher than the average. Surface air temperature from NASA AIRS data. Cumulative growing degree days above freezing gives a measure of total solar heat received for those days with mean temperature above freezing. Typically, snow will not melt until late March or early April; and the temperature drops below freezing during late October or early November. The number of days during which the temperature falls within a range is shown here. Monthly and yearly evapotranspiration estimated from MODIS from 2000 to 2010 using the model developed by University of Montana. The data for the years after 2010 will be updated soon. Click on image to download data of a particular month or year.